The Barmer and Cambay basins (India) formed as rifts during the Cretaceous to Paleocene, prior to Seychelles–India separation during Late Cretaceous. Both of the rifts failed subsequently and the Seychelles separated from India along the current Saurashtra–Mumbai continental margin. 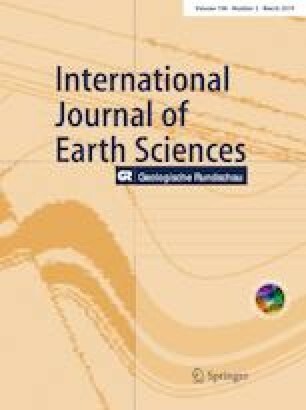 We study the fault kinematics, i.e., fault growth and linkages in the Cambay–Tarapur Block and comment on the fault evolution from syn- to post-rift stages. We use fault plane topography, throw-length and throw-depth plots to understand the kinematics of the fault planes. Throw-length plots show the along-strike linkage of faults. The throw-depth plots are used to understand the down and up dip linkage of the fault planes. Faults originating at the Deccan Traps level and faults confined only to post-rift progressed as single fault planes along-strike throughout their deformation history. Faults initiating within the syn-rift started as multiple along-strike segments and joined together as they grew. Along dip, faults can be classified as (i) faults originating at Deccan Traps and reaching post-rift, (ii) faults originating within syn-rift sediments and reaching post-rift, (iii) faults confined only within syn-rift and (iv) faults confined only within post rift. Some of the syn-rift faults also show spatially and temporally limited compression, indicating their possible oblique-slip nature. The faults were normal-slip or oblique-slip during syn-rift, and thereafter they propagated as normal dip-slip faults, as analysed from fault plane topography showing strike perpendicular ridges. Such ridges may indicate only the last movement on the fault plane. Due to the presence of thick shale horizons in the syn-rift, many faults show soft-linked segments along dip. Hydrocarbon occurrences in the shallow (1200–1600 m) Miocene sands can possibly be attributed to the normal faults controlling fluid flow into the reservoirs. (282 words). The online version of this article ( https://doi.org/10.1007/s00531-019-01706-w) contains supplementary material, which is available to authorized users. We thank Reliance Industries Ltd. for letting us use their data for this study and to submit this work. We also thank Sakunthala Chada, Raghvendra Singh, Tanmoy Mandal and Manjul Misra for their inputs. We thank Stuart Clarke and Rob Knipe for their reviews that improved the manuscript. David McNamara and Wolf-Christian Dullo are thanked for efficient editorial handling. Soumyajit Mukherjee is thanked for commenting on an early version of the manuscript. The results from this study were also presented (Misra et al. 2016) in Rock Deformation and Structures-III conference at Haldwani (India).